Gina says, "This card was made with an old Cosmo Cricket digital kit that I got last year from jessicasprague. They no longer have cosmo cricket on her site. I miss that! I love CC brand. Its really a bummer about that. I made the base of this card with all images from that brand and layered them. The tree pp is from a small My Mind's Eye Christmas paper pad. At the very bottom is a small strip of double sided tape that i used micro hot pink beads on to give the card some texture and I added some little dots of stickles in a plain glitter white color. Its a fun flat card that has a punch. " 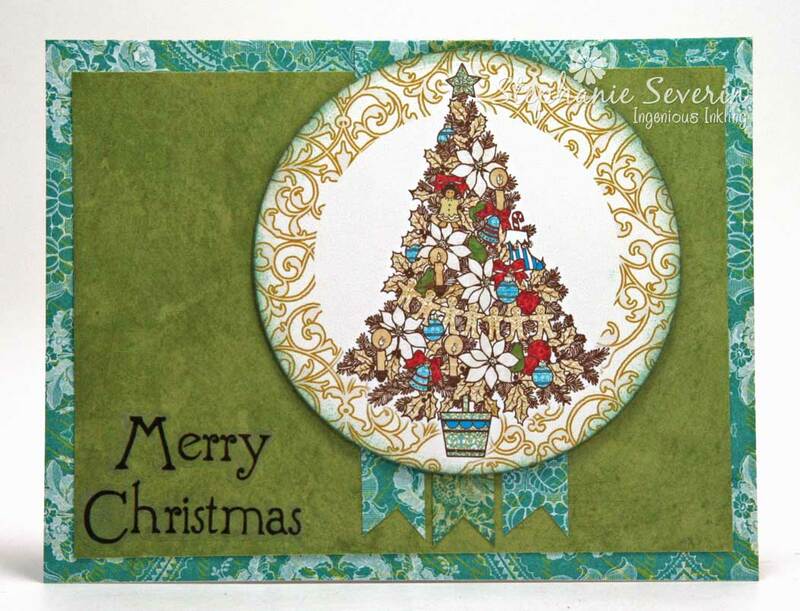 Stephanie says, "In my search through all of my digital elements, I discovered some pretty focal images from Webster's Pages including this lovely Christmas Tree, which I printed on white cardstock, die cut, and then *decorated* with lots of silver glitter pen. 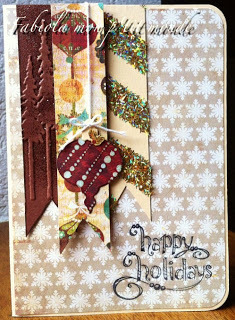 Of course, after doing that, I discovered that I had long since given away the remainder of the holiday papers from this collection, so I searched through my stash until I found some coordinating solids and patterns using this week's Sunday Stamps Sketch and a sticker sentiment for this hybrid design." Lauren says, "Whether I am working with "real" or digital supplies, my favorite format is collage. I already liked layering lots of different patterns and brushes together when I first started using Photoshop Elements, but after I learned how to use blending modes, it was TRUE LOVE, lol! This piece has 7 or 8 different elements digitally placed on top of each other, at various opacities. 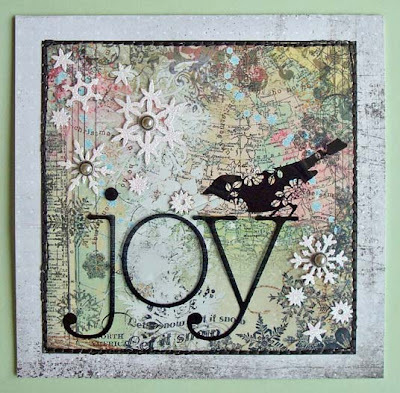 It was printed in two layers: the main collage (built atop an anna aspnes embellished map) on photo paper and the "JOY" on an inkjet transparency; before being sewn together and finished off with glitter stickers and brads to add texture. full image credits and a little bit about the layering process on my personal blog." 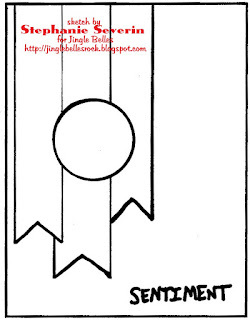 Have you already guessed from the title ♥JINGLE BELLES♥ what the prompt is going to be this fortnight? 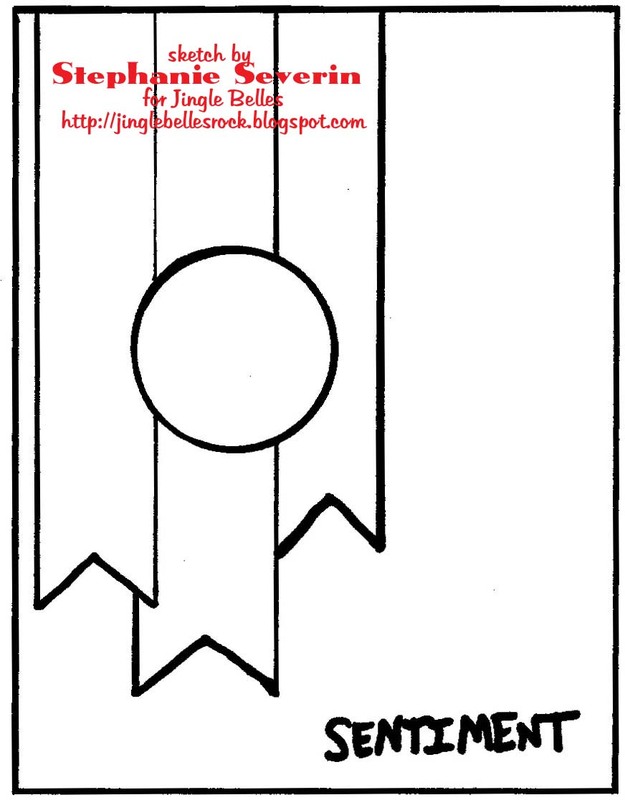 If you're thinking we want you to make a "hybrid" holiday card which utilizes at least one digital element, then yes, you have guessed, well done! 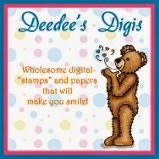 To help us inspire you to use your digital stamps, printable papers and other pixelly goodness, we've invited our good friend, Gina Cunningham, to be our lovely guest star! As well as making cards, carving stamps, art journaling and painting, this year Gina has been totally rockin' the digital version of Project Life, which you really have to see! In addition to her fabulous blog, Gina has a wonderful Etsy shop full of her gorgeous hand-carved stamps, a ton of awesome Pinterest boards, very cool Instagrams, and she is just starting her own YouTube channel to hold her crafty videos, so be sure to check out her links and leave her some love! Gina says, "I used a digital frame from Julia Makotinsky on Scrapbook Graphics and I brought it up in Photoshop. I then put it on a 8x10 white layer and used font to put around the greeting in an arch on the top and bottom. I printed that out and then inside the frame I drew my own santa and then traced him in ink. I chose to use watercolor paints to color him. 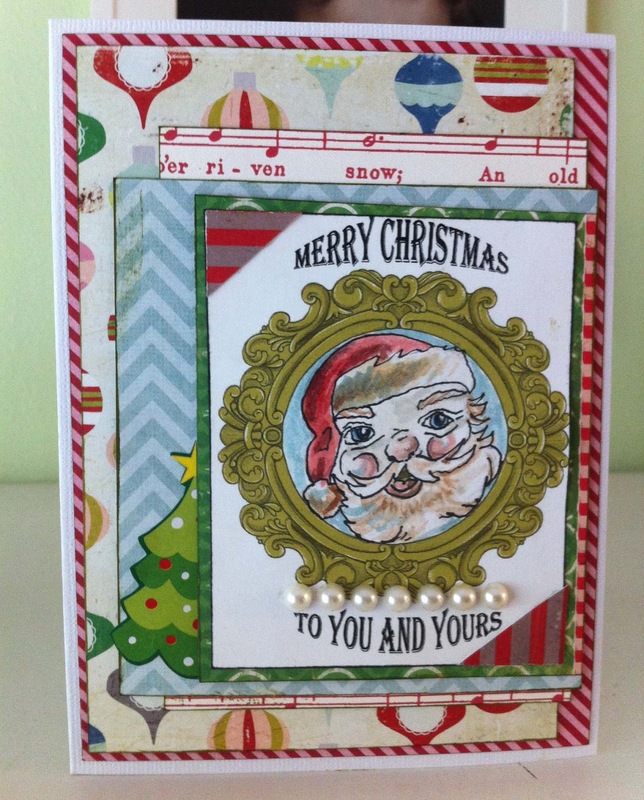 I placed many different layers of Christmas pp together and some pearl sticker elements. The half a christmas tree was a sticker I had that I wanted to use up. I placed this all on a white base card I got from Joanns." Stephanie says, "I have quite a collection of digital design products on my computer that I've picked-up along the way ... but I'm not so good about using them. I was glad for an oppportunity to break out digital paper & a digital snow globe image from Echo Park together with an Anna Aspnes Distressed Frame. 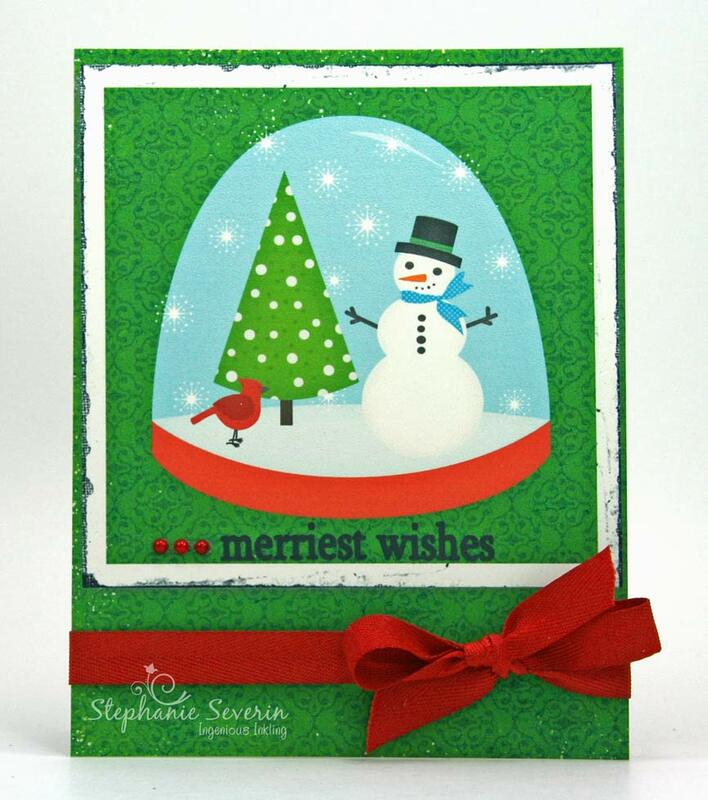 Once I composed my basic card on the computer, I printed it out and added a rub-on sentiment, pearls and a wrap of bright red holiday ribbon." Lauren says, "I've got lots of digital supplies, too, and i'm ashamed to say that i mostly use them to make blog headers or other things that will be seen online. Which is a shame, because hybrid cards are fun to make, and so very economical, since you can customize each bit, and you only need print what you're actually going to use! I've been meaning for months to make a card that features the kit I used for this year's ♥JINGLE BELLES♥ header, Christmas Shopping by Polka Dot Pixels, but it took a specifically digi-based prompt to make me actually DO IT. Having said that, I really like how this came out, and I have a feeling you'll be seeing these elements again!" Just in case you have *NO* digital elements, but would still like to play along with us, here are few links to freebies: The Graphics Fairy specializes in gorgeous (free!) 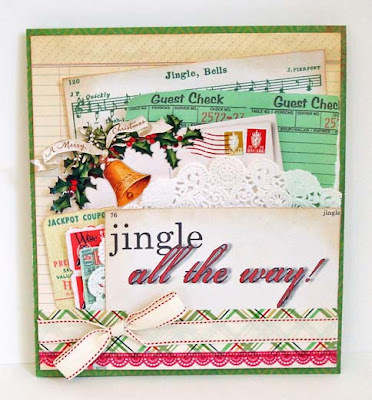 vintage images and has a nice Christmas Section; at Free Pretty Things for You there are some rather fab Free Pretty ChristmasThings; in O'Scraps Shop "freebies" section you could grab this pretty Cozy Christmas Day Add-On; Smitten Blog Design has this very cool Smitten Christmas Kit; Webster's Pages freebie section only has a few specifically Christmas items, but they are very pretty; and of course there are a zillion awesome digital stamping sites, many of which have regular freebies, too! Finally, I (Lauren) only just realized while prepping this post that Two Peas in a Bucket, who historically had one of the best digital sections of any online store (and by far the best freebies!) recently "retired" about 90% of their product line, which leaves quite a big (and slightly sad) gap in the digi landscape. However, there are bound to be loads more cool places we haven't even heard of yet, so if you have a favorite freebie, go ahead and leave us a link in the comments of this post! Link your own gorgeous digital/hybrid holiday cards up with us below between now and 6pm (est) on Wednesday, July 3rd. Keyword for galleries and our flickr group is JB:13:13. 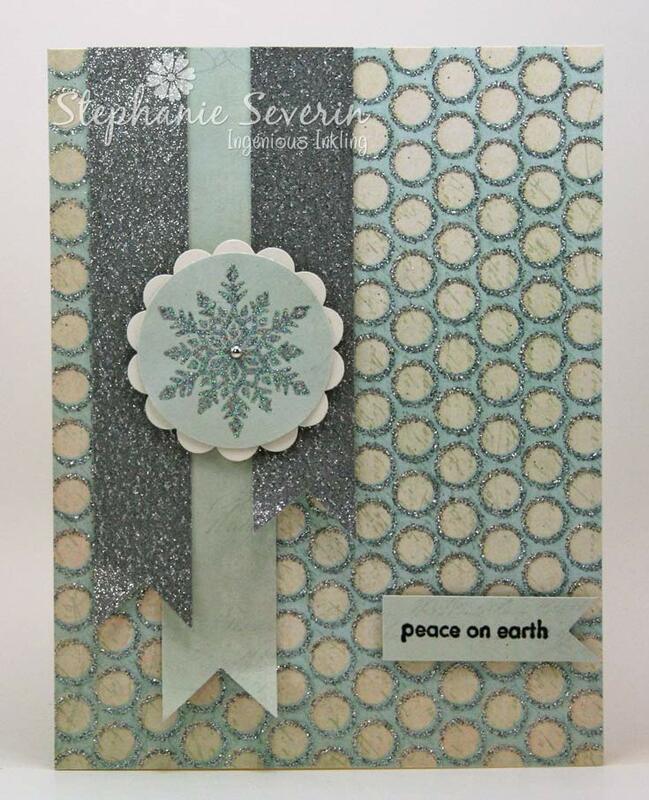 Stamped, embossed, and glittered her own patterned paper to make her extra-green, extra-sparkly version even more unique! 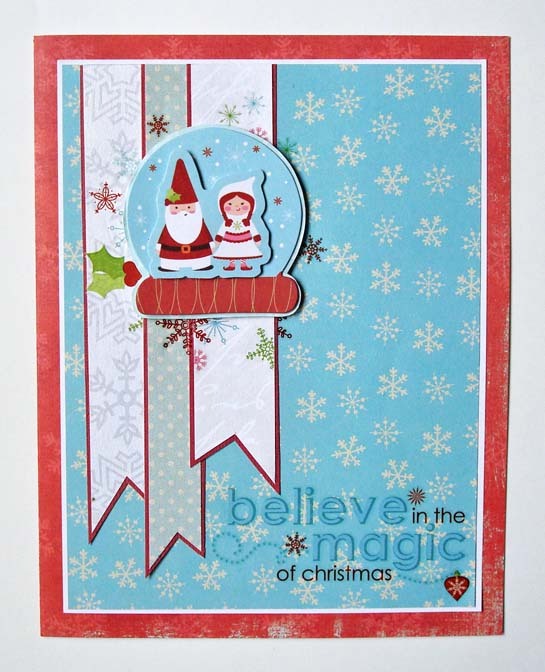 Combined loads of lovely pattern and a ton of gorgeous texture to make a delightful dimensional masterpiece that "stands out" in more ways than one! Literally made us gasp with the simple-- but brilliant-- innovation of rotating the sketch ninety degrees... and then executing a flawless CAS design! 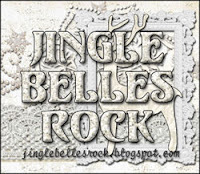 We'll be back at midnight with a fun new prompt, and a lovely guest star, to challenge you right down to your pixels, ♥JINGLE BELLES♥! A sketch like the one Stephanie has made for us this fortnight is just too much fun for us to stop at one card, so we kept going! Won't you join us?! 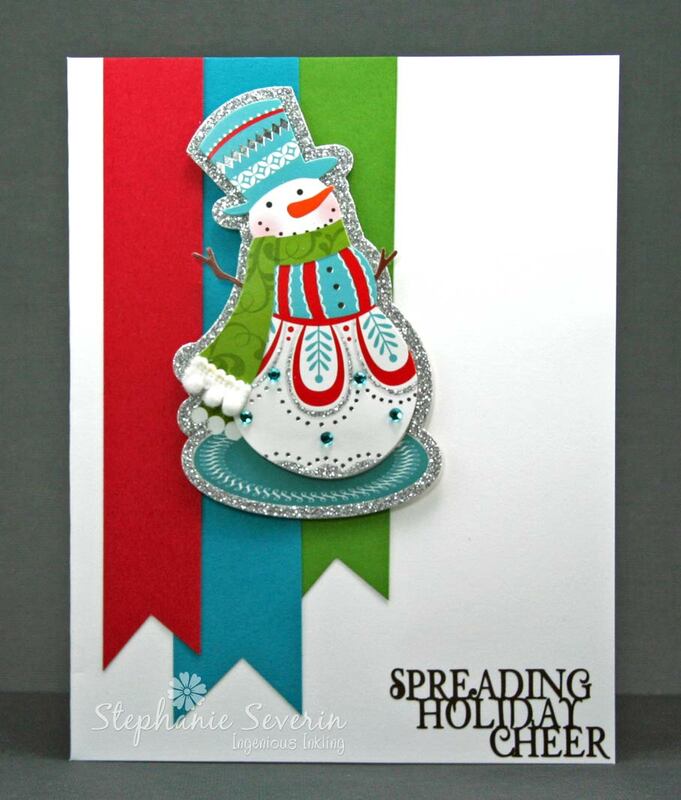 Stephanie says, "This week's sketch card started with this glittery snowman 3-D sticker (love the little ball fringe on the end of his scarf). I went to my scrap paper stash and found three coordinating colors ... and finished with an EAD Designs rub-on (sure wish someone else made vinyl rub-ons like they did) ... easy-peasy." Lauren says, "I heartily concur with regard to the fabulousness of EAD rub-ons, and I miss them on a weekly basis! On the other hand, these Imaginisce ones are pretty adorable, and coordinate perfectly with the snow globe sticker I chose as my focal point. I also used scraps for the banner elements, but mounted them on super-skinny mats of red cardstock to make them pop a little more. My background paper is another oldie-but-goodie: the last little happily hoarded bit of my "Love, Elsie" xmas paper... which still totally makes me smile!" We're getting sketchy again at ♥JINGLE BELLES♥ with this fabulous layout that Stephanie has devised especially for us! Stephanie says, "I had glitter from head-to-toe when I finished my holiday card. I started with glittery designer paper ... added glittery banners ... and then embossed my snowflake with glittery Aegean Silver embossing powder." Lauren says, "Usually *I* am by far the most likely Jingle Belle to be covered with glitter from head-to-toe, but not this week, lol! 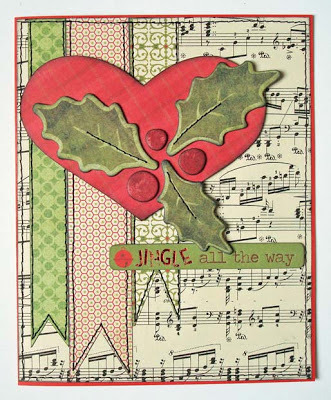 Instead I was excited by the combination of traditional red and green xmas papers from my scrap file and vintage sheet music. 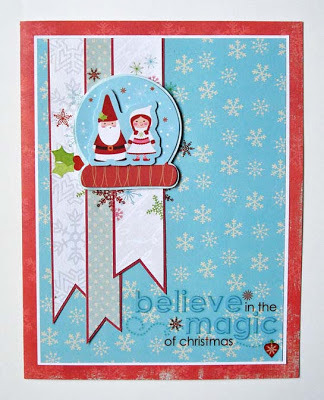 A few chipboard stickers and lots of decorative machine stitching later, I was happy to add another card to my December pile!" 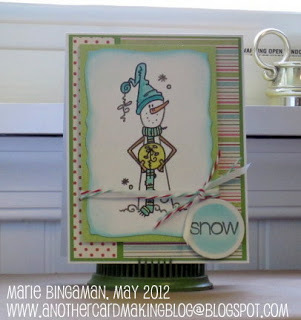 ...paired skinny ribbon with two shades of twine to dangle the perfect accent for her adorable snowman! 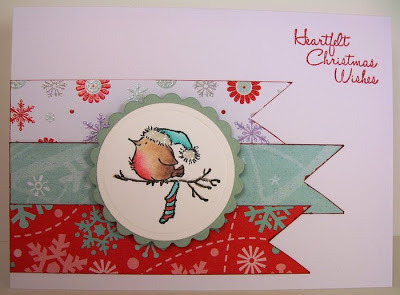 ...used the "traditional" red and green in her beautifully unique card that features ribbon (and fibers!) quite brilliantly! ...combined several different ribbons with lace and twine and sheet music in her collagey masterpiece!